Our TBEX North America 2019 speaking application is closed at this time as of March 17th, 2019. The TBEX North America 2019 Speaker Application (Billings, MT) is officially open….January 7, 2019 – March 17th, 2019. We will send out all accepts and/or declines by May 1st, 2019. Please plan for this and thank you for your patience. We’re continually on a quest for a collection of well-informed, interesting, and engaging speakers and influencers from around the globe for our events. 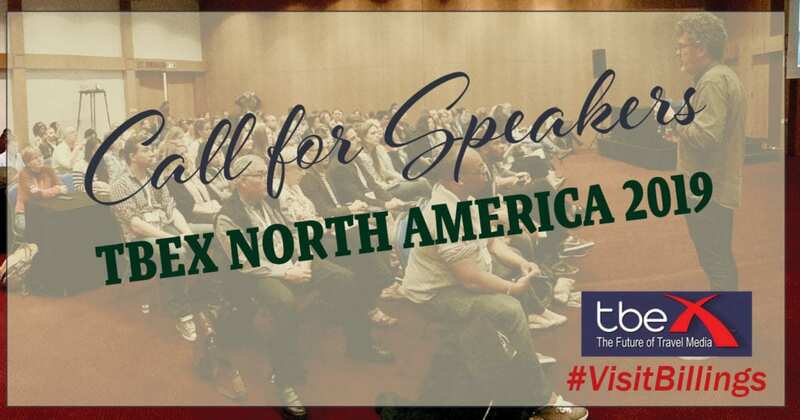 We require speakers who are committed to sharing valuable, actionable information with the TBEX community, and to being a full participant at TBEX North America 2019. If you would like to be a speaker for one of our Breakout Sessions, please read this information thoroughly before submitting a speaking proposal. *Note – If you have been a speaker at a previous event you still need to fill out the full application. Speakers should plan to arrive in Billings, Montana no later than Sept 10th early afternoon (VIP party that evening Sept 10th) and depart Sept 14th morning. Conference sessions are on Sept 12 & 13. We recommend that speakers who are also bloggers allow a few days before and after the main conference dates to enjoy the pre- and post- tours and activities (Sept 10-11 & 14, first come first serve sign up once tours released) along with Blogger FAM trips (starting Sept 14, full application process). Information about these opportunities will be announced soon. TBEX break out sessions are 50 minutes in length and should allow between minutes for questions and answers. We seek advanced topics with practical information and examples. Attendees should leave your session with a step by step guide on how to action your ideas. They are looking to improve what they are doing, rather than looking for a primer or basic how-to. We are looking for narrow topics, with a deeper focus on specific best practices and new breakthroughs. Your session should not be a product pitch, nor promotional for your blog, company, or services. Promotion and buzz about your company will naturally flow from delivering a high quality session. Attendees complain loudly – about sessions that are self-promoting. When you try to sell from the stage, YOU ARE HURTING YOUR BRAND. Speakers are not guaranteed a spot of FAMS. Most FAMS provide for only one person per website, so there are very limited spots available for a second person from the same website or for a partner of a FAM applicant. Flights and Hotel are not provided for sponsors speaking at TBEX.